Let Us Make Your Restaurants Beautiful. Keeping your property of you restaurant’s lawn a healthy green and free of weeds involves all of work. Here in South Florida there are an abundance of lawn maintenance companies to chose from but not all get it right. The experience of getting food from any type of restaurant begins in the parking lot. An appealing property and curb appeal goes a long way with patrons. Regular cutting, trimming, weeding, and other maintenance is required to achieve this look. Leave it to the experts at Pink and Green to create and maintain an environment that will assist you in bringing customers back. As a restaurant management group, your reputation is always at stake. For this reason, it is advisable to hire the expertise of a reputable lawn maintenance company to carry out monthly lawn service and maintenance on the restaurants managed by your group. Pink and Green Lawn Care and Landscape is perfect to get the job, we specialize in it and have over 800 online reviews to back up our service. At Pink and Green, we offer premier monthly lawn maintenance services. Our aim is to ensure that your restaurant and its surroundings look beautiful and appealing throughout the month and year. We are always ready to dedicate every available resource at our disposal including manpower and technical expertise to offer you the very best of lawn maintenance services. Our services are detailed, transparent, and highly professional. Our ability to always deliver exceptional services makes us the preferred lawn maintenance expert for many restaurants and restaurant management groups in Fort Lauderdale and Miami, FL areas. Let our professional team handle everything involved in carrying out lawn maintenance of the properties at the restaurants managed by your group. At Pink and Green, our team consists of dedicated, experienced, skilled lawn care experts. Our lawn care professionals have been put through comprehensive training on how to provide top-tier lawn maintenance services. Our lawn maintenance experts will handle various activities including mowing, edging, hedge trimming, weeding, blowing, lawn fertilization, and lawn pest control. We also provide tree trimming and mulching. Our comprehensive lawn care services are guaranteed to meet your needs and keep your lawn and landscaping looking its best all year around. Our monthly lawn maintenance does not only make the lawn of the restaurant managed by your group beautiful and appealing, but it also increases the quality and value of the restaurant. 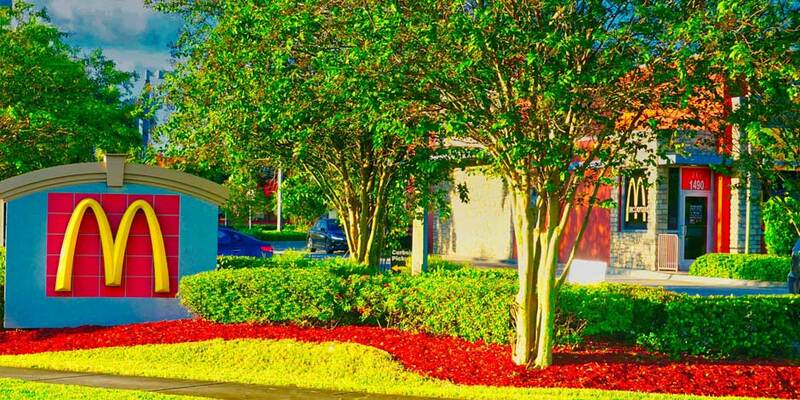 With our professional landscaping services, you can increase the curb appeal of your restaurants. No other South Florida lawn maintenance and landscaping company has what it takes to deliver unparalleled services like us. Quality workmanship and prompt services, attention-to-detail, and outstanding customer service are some of the things that set us apart from other lawn companies. All our services are carried out with a high level of professionalism. Our services can be tailored to your budget and lawn maintenance needs. We will set up a routine maintenance plan for you. With this, we can keep your lawn green, healthy, and vibrant all year around. Contact us today to know more about our services. Our experts will be available to speak with you and discuss your options. Be assured of getting excellent services that will surpass your expectations.